Categories: BAR & BEVERAGE, Beverage Dispensers, FUN FOODS. Our dual frozen drink machine produces 2 flavors of frozen drinks at one time, or you can make twice the amount of one flavor. Holds 3 gallons in each hopper for a total of 6 gallons. Great for both small and large events. This dual frozen drink machine is similar to a slushy machine that you would see in a convenience store. Why not rent a dual frozen drink machine for your next special occasion? 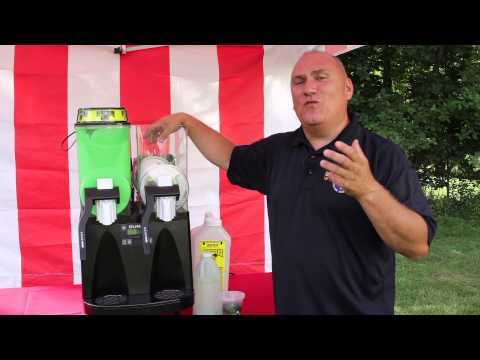 Below you can watch a video about how to setup your dual frozen drink machine. Also view our product FAQs at the bottom of the page. This is not a blender or an ice crusher. This machine is meant to be used with the flavors that we provide you. Never put ice, fruit, chocolate, or anything similar in this machine. How long does it take to make a Slushie? 45- 60 mins. Do not place machine in direct sunlight.